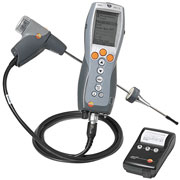 Testo 340 - Combustion Analyzer Kits, Upgrades, Accessories, Sensors & Probes | Don Wolf & Associates, Inc.
Optimizing combustion, increasing efficiency and minimizing fuel use are necessary to compete in today's market. The Testo 340 provides the information to understand your process, enabling you to make informed combustion decisions. It is the ideal tool toconfirm proper set-up or identify emission problems. so you can keep testing! Designed for simple, fast operation and constructed for demanding daily rugged use! Some combustion sources run normally high concentrations while others are high because of inadequate control or flawed set-up. High concentrations can reduce the normal life span of sensors. Testo's solution is replaceable interference filters on the CO and NO sensors. Analyzer diagnostics will display the filter lifetime in ppm hours to inform you of filter change-out which is easy and quick to replace. This simple process increases accuracy and extends sensor lifetime. Testo has a complete line of products to assist in testing the exhaust gas of each diesel powered unit. The testo 340 four-gas analyzer is perfect identifying concentrations of O2, CO, NO, and NO2 and SO2 for mining applications. The button gives you the power to know. Perform an automated quick leak check before your test. easyEmission software gives you extraordinary data management skills with real time analyzer control. It has the power to import/export data from a variety of formats and prepare custom reports and documents using today's common Windows-based applications. Learn more by going to the easyEmission page. Every probe and hose assembly is constructed of the highest quality material. The probes cam-lock connection to the 340 assures your security and safety during testing. The standard Teflon hoses are also heat-resistant.